Andrew was born in Bolton in 1975. Andrew grew up in the dying industrial town of Horwich, Lancashire. His childhood was spent in the rusting work yards of railway works and in his father’s joinery workshop. He currently lives in a rural hamlet on the West Riding of Yorkshire a million miles from the industrial landscape of his childhood. Andrew’s first poetry pamphlets were Technical Support (1997), Columns of Frozen Light (1998) and Breathing Slowly? (1999). He worked over the next ten years in high profile residences in the North West, Yorkshire, Nottinghamshire and North Wales. His poems have featured in such publications as Ambit, The London Magazine, Interpreter’s House, North American Review and Poetry Salzburg. Andrew is a nominee of the Jerwood-Arvon. His first full poetry collection, Ghosts of a Low Moon (Lapwing, Belfast, 2010) was met with critical acclaim (One of the brightest and most memorable British poetic voices of today – Vince Gotera, Editor, North American Review). 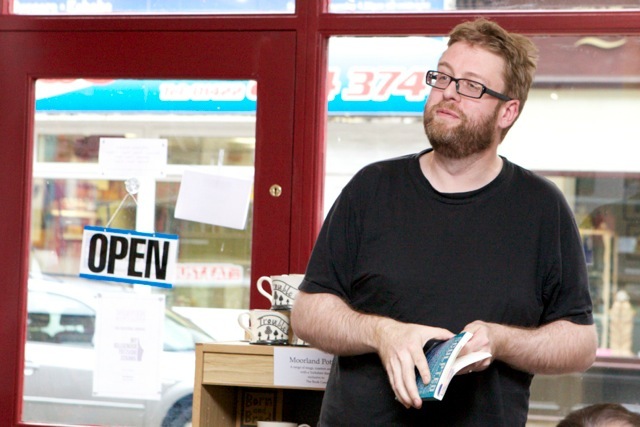 He has been included in such important anthologies as Versions of the North: Contemporary Yorkshire Poetry (Five Leaves Press, 2013) and Lung Jazz: Young British Poets for Oxfam (Cinnamon Press 2012). His poetry has been heard on BBC Radio Four’s Poetry Please. Andrew’s short fiction has been published by Unthanks Books, Route Books, Transmission and online at The Sunday Times. His first breakthrough fiction in the late nineties was Neuter, which was shortlisted for the trAce/Alt-X Hypertext Prize. The text was finally included in several US university digital writing programs. He has been cited as one of the first wave of UK writers to write for the internet rather than reproduce work on it (this transliterary movement has been documented and discussed in Transliteracy in action: Digital Livings). Andrew is also a journalist and regularly contributes to The Guardian online. He continues to write poetry, fiction and journalism.